With fast wireless speeds, you do not have to worry about dropped connections or buffering, while you enjoy gaming with competitors from around the world, streaming HD movies with friends, video chatting with family, or sharing photos with all of your followers on social media. 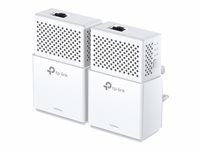 Turn any outlet into a high-speed Internet connection with the TL-WPA8730 KIT. It uses your home's electrical wiring to expand your current Wi-Fi network and provide AC1750 Wi-Fi in any room. Plug in the adapter and place extenders for a reliable wireless network, where you need it. With advanced HomePlug AV2, your extenders incorporate 2×2 MIMO technology to provide blazing-fast data transfer speeds. Beamforming technology takes you farther by focusing the data transmission, where you need it. First, connect your TL-PA8010P to the router. 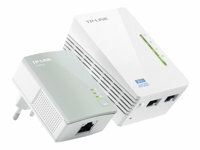 Then, plug in the TL-WPA8730, wherever you need extra coverage. Finally, press the "Pair" button on each adapter.